Cinnamon rolls are a little hit and miss, I find. 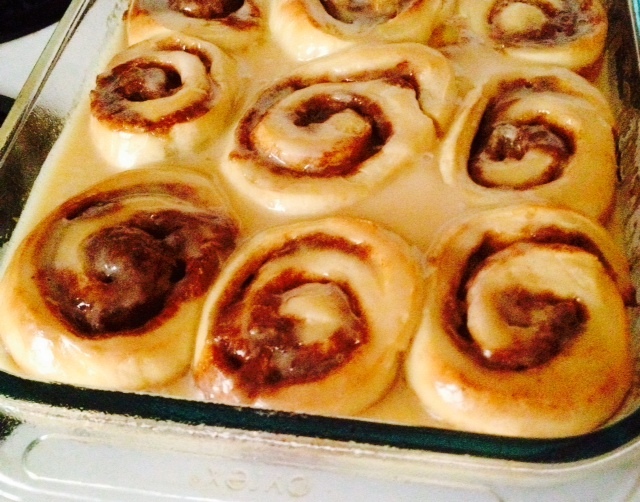 They can be too dry, too doughy, too sticky, too much icing or not enough. I also probably don’t need to state for the five millionth time that if it doesn’t incorporate chocolate, I am usually not interested. Maybe the reason I can turn down a cinnamon roll with ease is because nothing could top the best one I remember ever eating. I was on a high school trip in Edmonton if I recall correctly and after a day of shopping our hearts out, us girls were hungry. As we got closer to the food court, the most amazing smell was teasing us and one of my friends said, “Smells like Cinnabon! I’m getting one for supper!” Cinnabon? Who on earth would choose a cinnamon roll over all of the other awesome things in here?! I thought she was nuts. Until I saw her gigantic Cinnabon, hot, fresh and absolutely dripping with thick white icing. She shared a bite and I copied her immediately. It really was the best thing in the world and I understood what all the fuss was about after that. However, Cinnabon isn’t around here and nothing has been able to match it since. I knew that the next best thing would be homemade ones. Being able to prep them the night before and popping them in the oven the next morning for a fresh breakfast would have been even better. I love sleeping in a little so dishes I can make the night before are always a winner in my book. I found a great recipe and they were surprisingly easy to throw together; I woke up the next morning, popped them in the oven and doctored up a basic glaze with sea salt and caramel sauce. I poured the glaze over the hot, bubbling rolls and packed them up to share with my Main Taste Tester’s parents over morning coffee. The verdict? These were AMAZING. Super fresh and soft, gooey, sweet and full of cinnamon flavor. I loved the addition of salted caramel to the glaze as well. These were such a hit that I made a second batch to share with the girls at work yesterday. Make them this weekend for someone you love! In a small saucepan over medium heat, warm milk until it bubbles. Remove from heat and add butter. Stir until melted and let cool until lukewarm. In the bowl of your stand mixer fitted with dough hook, stir together half of the flour with the other dry ingredients. Add eggs and milk mixture. Beat well until combined. Add the rest of the flour ½ cup at a time, mixing well after each addition. When the dough is well mixed, spread it out on a floured surface and knead it until smooth. You can add more flour if needed. This should take about 5 minutes. Let the dough rest, covered for 10 minutes or so while you make the filling. Mix all of the filling ingredients together in a small bowl and set aside. Roll dough out into a rectangle, about 9×12 inches. Spread filling evenly over dough. Starting from the bottom, roll dough up into a long log. Pinch dough together to seal. Cut dough into 12 even rolls. Spray a 9×13 Pyrex with cooking spray and place the rolls inside. Cover and let rest overnight. In the morning, preheat oven to 375 degrees. Bake rolls for 20-30 minutes or until golden and bubbling. While rolls bake, stir all glaze ingredients together. Pour glaze over rolls while they are still warm. Serve! I am one of the girls from work and they were delicious and a real treat for Friday morning coffee break. Keep on baking! Thanks Shirl! More to come! Made these on the weekend and they were devoured!! Delicious! !